Easy to attach shelves and accessories. Bedding can escape through slats. 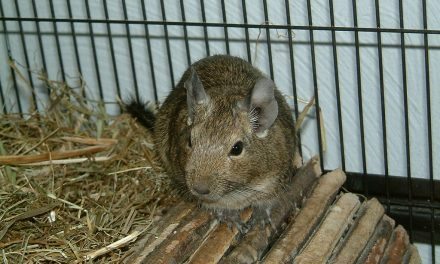 Some more bothersome degus will chew on the bars. Are a bit of a visual obstruction for watching your critters. 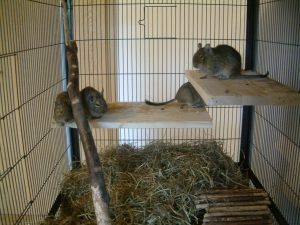 Allows for climbing the bars (for degus who think they are spider monkeys). Great for hand feeding walk by’s (treats through the slats). Tedious to clean: scoop out the bottom (or remove tray) and wipe or spray down all bars & platforms. 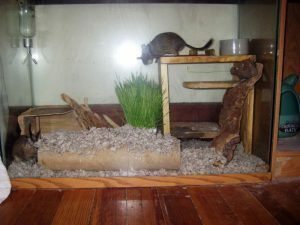 There are a wide variety of styles from ferret, rat, bird cages are available at many locations. Typically open only at the top which provides less air circulation. 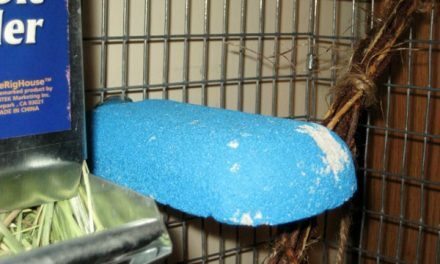 To add cage accessories you must suction cup, glued, stand from base or hook over the top edge. Bedding cannot “fly” out of a tank very easily. 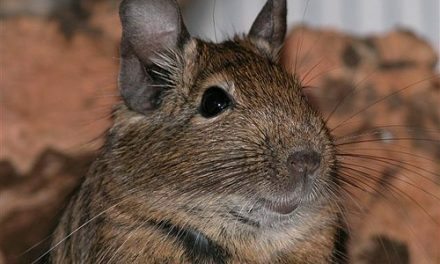 Degus can’t chew on a flat glass surface (but they do go after the clue in the sides and the plastic at the top if they can reach it. Allow a clear view of your fuzzy little friends at all times. Cannot climb up the flat glass but will press their paws and nose up against it for attention. You have to remove the cover in order to have any access to your degus. 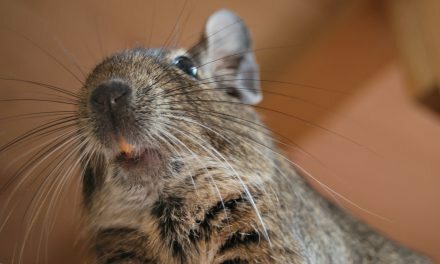 Easy to clean, remove degus and toys and accessories and flip the tank on its side to dump out the dirty bedding into a trash bag. Then spray or wash the glass (inside and out). It’s a pretty fixed price tank market out there but craigslist and no longer waterproof ones come at bargains if you are looking for em!